Our first stop in Italy, Dro and Camping Paolino. Ding-dong. I was lying in my bed and listened the church bells. Central and Southern Europe is filled with churches and their bells make a loud noice. Every hour, the most annoying ones every 15 minutes. Ding-a-ling-clang-dong. Three times. So it was three o’clock. AM. I can’t even count how many times I have woken up in the middle of night because of church bells. No matter were we in Germany, France, Spain or Switzerland. But this time I hadn’t woken up. I was in Italy and at 3 am just about to go to sleep. We came to Italy for Modena PLAY. This was the tenth time PLAY was arranged. The event has grown a lot, but has managed to maintain a relaxed atmosphere. What was surprising to me, was the opening hours. In Italy, most of the activity begins after 6pm, so the fair is open until 8 pm. On Saturday the fair was open 11 hours! From the very first day it was clear that Italian gamers like cosplay. We soon got used to gladiators, faeries, robots and stormtroopers that kept passing the booth. Unlike in any other convention, the doors were open also to four legged friends. You had to be careful when moving in the crowd not to stumble on a labradorian retriever laying relaxed in the middle of an aisle. 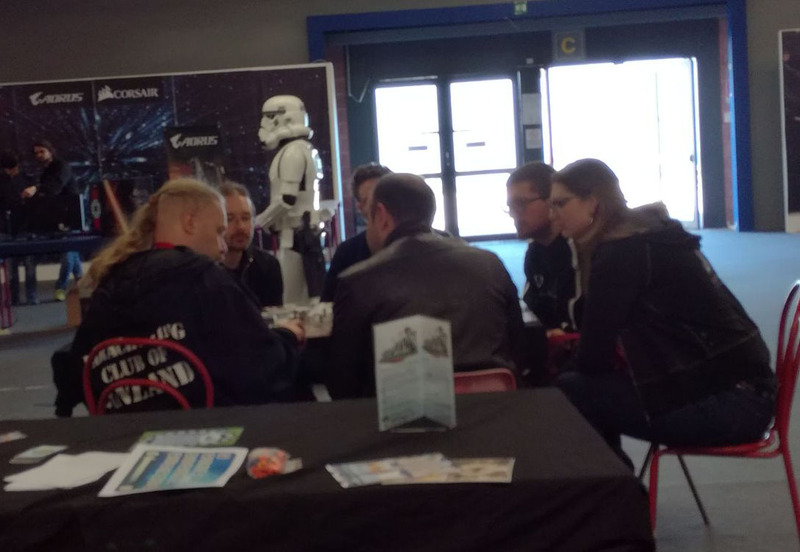 We met many of our Italian gamers and the resellers we have been working with. It was also great to meet MarcoValtriani who is one of the quest designers in Perdition’s Mouth Revised Edition. And also our dear friend Dagmar de Cassan – this was the third time during our tour! Marco Valtriani and Timo in Modena PLAY. designed by Dagmar de Cassan. After PLAY we had two weeks of gaming events booked with local gaming clubs, thanks to our translator Fabio and to Pietro Cremona. Pietro and his players were one of the many play test groups for Perdition’s Mouth. We wanted to get their opinion of Darwinning, too. Of course we were also spreading the happy news of soon available Italian version of Perdition’s Mouth Revised Edition. These gaming events were in the evening. In Finland that would be ”soon after 6pm”. But in Italy, it meant ”starting after dinner, at 9pm”. In the first evening I was too tired to join in, so Timo and Väinö went together. I woke up half past midnight, and they were still not back. It was pouring rain, so I was a bit worried and phoned to Timo. I heard they had just left the event– and it would still take over half an hour for driving. After second evening we noticed that these evenings were too late for Väinö. Even if we didn’t have to wake up early in the morning, this changed schedule was tiring. Adjusting to caravan life has been surprisingly easy. I mean, I haven’t really missed anything. Except sauna. Surprisingly we found one at a camping place next to Lake Garda. It was heated just for us, no extra charge. It had nice temperature of +80 C and we were allowed to throw water on the stove. The only minus side was, that the water in the bucket had some eucalyptus drops in it. Way too much eucalyptus. We changed the water twice, rinsed the bucket, and then it was possible to have proper ”löyly”. In Italy we have also missed proper internet. Most of the camping places do not offer wifi, at least not for free. And even with money, the speed of data transfer is depressingly slow. There are data limits for the free roaming. When we have two games under production and a lot graphics to transfer, the lack of fibre optic is really noticeable. We had also booked a vacation in Rome. In our case, vacation does not mean ”time when you do not have work”. It means ”time when you can relax a bit more”. Timo’s parents came also to Rome and offered to accommodate Väinö in their hotel. So me and Timo were able to spend some time together. It was sunny, temperature nice +25. We bought a barbecue, an outdoor mattress, some sausages and good rucola salad from Lidl. We opened up a bottle of champagne. A proper champagne, that Timo had got as a present almost 20 years ago. We ate our dinner from plastic plates, under the sun roof and listened to extremely loud pigeons. That I would a call a proper vacation!